One of the problems with the minimal desktop based on Openbox is the distinct lack of GUIs for common system admin. Luckily ChameleonOS has the Unity Linux Control Center (basically the famous Mandriva Control Center) which is great for configuring hardware, networking and users. However, it doesn’t help with your day to day desktop settings much. 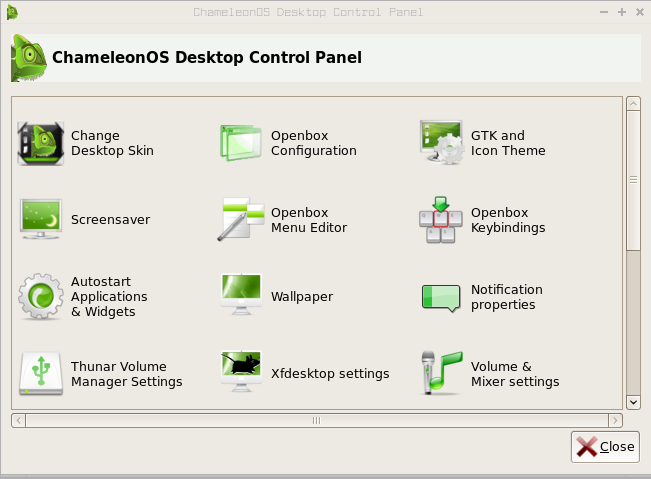 To this end, I have developed the ChameleonOS Desktop Control Panel. It’s a simple PyGTK window that provides links to GUIs that will help you control every aspect of your desktop appearance and experience (plus a few other goodies to boot). Thanks to Adcomp for his work creating GUIs for Openbox just about everything is taken care of. This entry was posted in Openbox, projects, scripts. Bookmark the permalink. Are you a programmer? Are you willing to do what it takes to make your OS the best or at least better than it is? I have a idea, but you have to be a programmer?